To all of the volunteers who make our annual Celebration of Life Thanksgiving Dinner for the HIV/AIDS community possible, members of the HIV/AIDS community were able to share a beautiful evening with friends and family because of you. 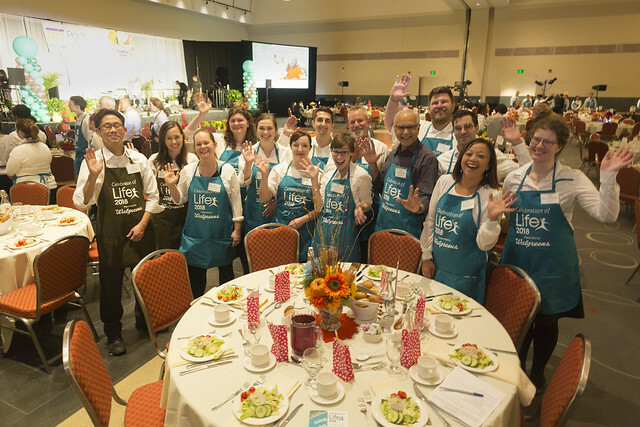 And to all of our supporters, donors, volunteer fundraisers, community partners, and corporate friends who gave generously this year, we raised more than $135,000 for vital nutrition, education, wellness, and peer services at the Boston Living Center, New England’s largest community and resource center for people living with HIV/AIDS. This incredible celebration, originating as a humble gathering of friends during the height of the AIDS epidemic, has endured for three decades because of supporters like you. Today, and every day, we are deeply humbled by your generosity, kindness, and compassion. Peter Daniel Clark was a founding member of the Boston Living Center and one of the individuals at the very first Celebration of Life gathering. Peter passed away in 1992 of AIDS-related complications, however, he still holds an important place in the Boston Living Center family. Each year we present the Peter Daniel Clark award to individuals or organizations dedicated to advocating on behalf of and serving the HIV/AIDS community. This year’s honoree will be Dawn Fukuda, Director of the Office of HIV/AIDS at the Bureau of Infectious Disease and Laboratory Science at the Massachusetts Department of Public Health. Dawn has made working to end the spread of HIV/AIDS her life’s work. Prior to working at the Massachusetts Department of Public Health, Dawn worked for AIDS Action Committee and Jordan Hospital. She has a long history of advocacy work and of promoting prevention services. Dawn maintains strong relationship with members of the community, providers, and advocates working to shed light on the current state of HIV/AIDS in the Commonwealth. Brenda Bellizeare was a staff member and member of the Boston Living Center. She was also a powerful voice for the HIV/AIDS community. She used her experiences to help shape services for others living with HIV/AIDS and to provide powerful advocacy on behalf of her peers. In honor of Brenda, we present an annual Brenda Bellizeare “BIG” Better It Gets award to a Boston Living Center member who, like Brenda, has inspired others and whose journey is going to keep getting better. This year’s honoree will be Wilson Valencia. Wilson is well known at the Center for helping other members during workshops and classes. His personal journey is an inspiration to those who know him.